Adult: $60 for WFDT 2017 Jam book of tunes/cds, pass code to music download, and all World Fiddle Day events at the Aga Khan. 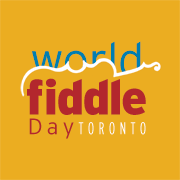 World Fiddle Day events include workshops, the Around-the-World fiddle jam and the evening concert. Financial assistance may be available – talk to us. Funds an issue? Just talk to us. .
1. Admission for the entire World Fiddle Day Toronto, including two workshops, the Around-the World-Jam and the evening concert in the beautiful Aga Khan auditorium with: Pascal Gemme/Yann Falquet, Quebecoise; Anne Lindsay, Scandenavian; Kousha Nakhaei, Iranian; Amely Zhou, Chinese; and DnA (Old Time Ontario fiddle/stepdance duo, Andrew and Diana Dawydchak). See the Around-the-World Jam page for a complete list of practice session dates, tunes to be covered, and directions for Long & McQuade.